Dave Challinor has stressed the importance of AFC Fylde’s pre-season preparations as they gear up for the new National League campaign. The Coasters finished in their highest position last season, clinching a play-off spot on the last day of the season before being knocked out by Boreham Wood. Challinor’s men, who will no doubt be hoping to go one better this season, returned to training last week ahead of their first friendly, which comes against Championship neighbours Preston North End on Saturday, July 14. 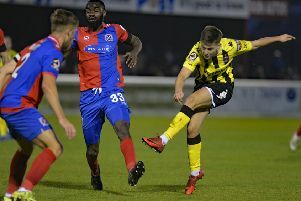 “Pre-season is massively important,” Challinor told The Gazette. “Getting a good pre-season will stand you in good stead for the start of the league campaign. “It’s important to get your philosophy over to the new players that come in, so friendlies help with that. “Results, yes they help but they’re not the be all and end all. Ultimately it’s going through a process to get fit for August 4. That’s what the sole focus is for everyone. “Preston will be a good game. To have a big crowd at Mill Farm will be fantastic and hopefully everyone will want to play in it. “But ultimately it’s about getting to a level to perform, that’s the important thing. “We started pre-season training on Monday. I suppose you couldn’t have asked for a better week in terms of the weather for us to get going. Fylde have only made three new signings so far this summer in Luke Burke, Neill Byrne and Ryan Croasdale. When asked if Fylde are close to sealing any more deals, Challinor added: “I’m not sure about this week, but we are actively looking all the time. “If we can get ones in to strengthen the squad then we will do. Regarding potential outgoings, Challinor said: “Unless something out of the ordinary comes in then we’re happy with where we’re at. “From my perspective, and the club’s perspective, the window shuts at the start of August and if I was a Football League manager I’d have been making enquiries as soon as last season finished.